Trip to Raasay on which I saw about a dozen species/subspecies of plants that I'd never seen before on Skye/Raasay. On my own I don't expect to get that many in a year, never mind a day, but I was fortunate enough to be in the company of Dr Stephen Bungard, the joint BSBI recorder for vice-county 104 which includes Skye and Raasay. He has made an intensive study of the flora of Raasay and several of the species in these pictures are ones that he himself was the first to find on the island. So lets get straight on to the orchids. 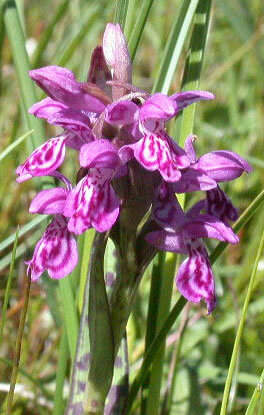 On the left, the Lapland Marsh Orchid, not discovered in Britain until 1986. 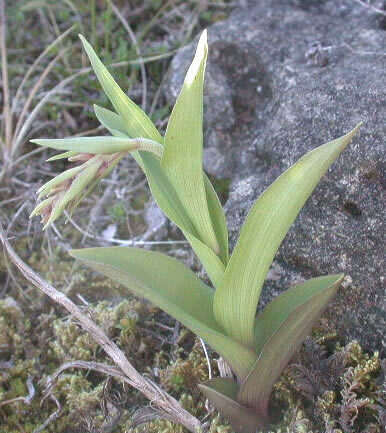 The colour and patterning are similar to the Northern Marsh Orchid, but the lower petal has a substantial central tooth, and the flower-spike is decidedly one-sided. 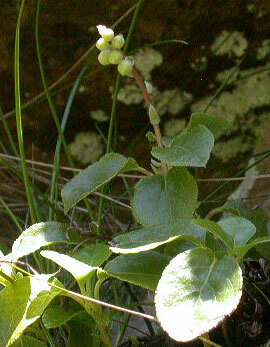 There is heavy spotting on both the leaves and the stems, and sometimes on the flower-bracts. On the right, ssp coccinea of the Early Marsh Orchid. On 8 June I showed what I took to be ssp incarnata (pink) and on 12 June I showed ssp pulchella (purple). Apparently some experts think that ssp incarnata does not occur on Skye/Raasay and that all our pink ones are ssp pulchella, as our purple ones are. This is supported by the fact that the pink and purple types sometimes occur together as if forming a single population. 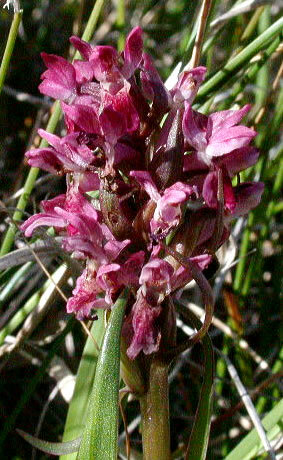 The books, however, do not allow ssp pulchella to be pink, and our pink plants key out as ssp incarnata. Whatever the facts of that case, the red one in the picture above is definitely ssp coccinea. This was first recorded on Raasay 70 years ago but has only recently been re-found. We were a bit early for the Dark Red Helleborine, above left, which was still in bud, and a bit late for the Frog Orchid, right, which had lost bits of its flowers but you can still see the general appearance quite well. The wrinkly leaves to the right of the picture are Mountain Avens (Dryas octopetala). Now some less rare orchids, but still a welcome sight. 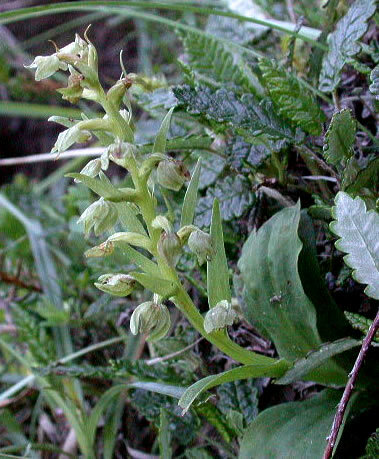 On the left, the Lesser Butterfly Orchid, and on the right one of the flowers from a fine specimen of Common Twayblade. We also saw numbers of Lesser Twayblade as we walked across the moors, without needing to bend down and part clumps of heather as one normally has to. 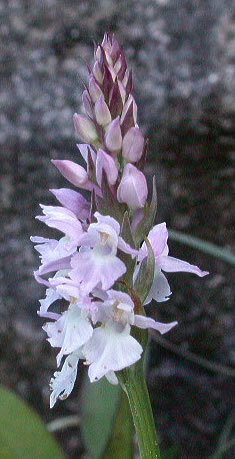 The centre picture shows an unusual form of Common Spotted Orchid, or it may be the hybrid between that and Heath Spotted Orchid (Dactylorhiza maculata ssp ericetorum). The leaves were totally unspotted, and the flowers also have no markings, but start off mauve and turn white. That's Orchids done, now Wintergreens! There are four species on Raasay, but until today I'd never seen any of them on either Skye or Raasay, so it was a great thrill to see two of the four species in a single day, even though they weren't in full bloom. On the left, the Toothed Wintergreen, with flowers almost out, and on the right the Round-leaved Wintergreen, which seldom flowers, so we had to be content with leaves only, and I had to kneel on the edge of a steep drop to get a picture of those. White Water-lilies are common in our lochs, but this was the first time I'd seen the Yellow Water-lily in this part of the world. I'd always thought of it as a plant of lowland canals and suchlike, but was instantly converted, as a Highland loch definitely suited it better. A beautiful scene, but could not get close to the plants with the camera. 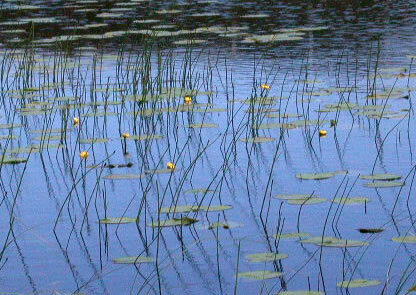 The species may even be native - it has certainly been known in this loch for a long time. 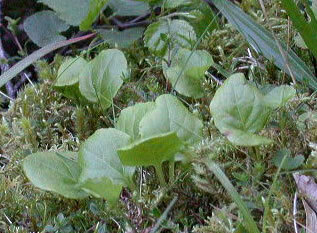 Still more plants that are scarce in the area. 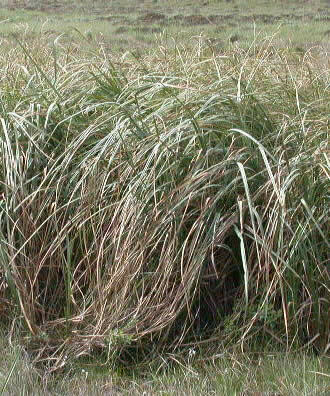 The Great Fen Sedge, above left, forms spectacular stands quite unlike any other sedge in these parts. 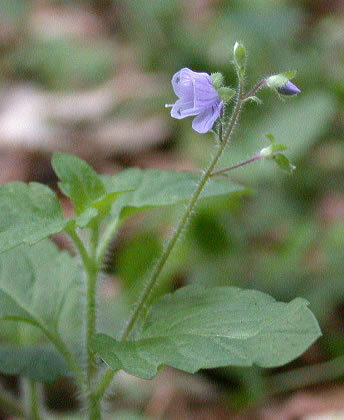 On the right, the Wood Speedwell is much less conspicuous, and lives among the leaf litter in the shadier parts of woods. Finally two unusual ferns, both members of the Ophioglossaceae, which have the frond divided part-way up into a fertile spike and a sterile blade. On the left, the Adderstongue, a rather dwarf specimen from an exposed cliff-top, which may be Small Adderstongue, identity not yet confirmed. 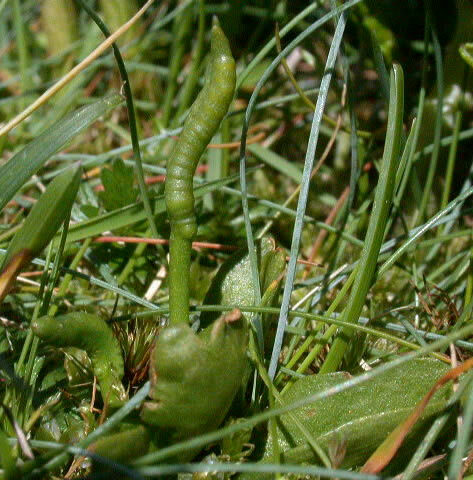 On the right, by contrast, the largest Moonwort that I have ever seen. This was not on Raasay but on my way home, near Sligachan. 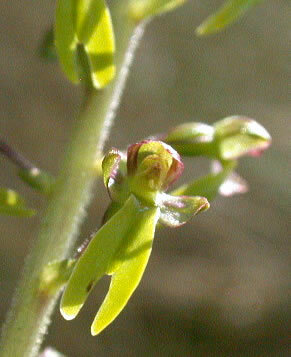 The plant was 8.5 cm from base to tip.